Cruise ships dock at the port of Santa Cruz. Free shuttle buses are provided by the Tenerife Port Authority, which bring you to Plaza de Espana, the center of town, where pedestrian shopping streets converge. Taxis are generally available at the pier. If it is not too hot, it is pleasant walk into town. The new terminal features a berth length of 395 meters and a depth of 10 meters, along with a large check-in area with 50 desks. The terminal will be the biggest in the region at 8,473-square-meters, with a large staging area for taxis and buses. There are also two state-of-the-art gangways. The entire facility is a five minute walk to the city center. Note: Some cruise companies might say that the free shuttles are only for persons with walking disabilities, but they are there for everyone. The airport is about nine miles from Santa Cruz. Taxi is 15-20 Euro. Check here for festivals and events in Tenerife when you are in port. Tenerife, the largest of the Canary Islands, is also one of the most scenically stunning islands in the world. Dominated by the gigantic outline of 12,402 ft.-high Mount Teide, this amazing volcanic island offers a wide variety of landscapes and tourist experiences. 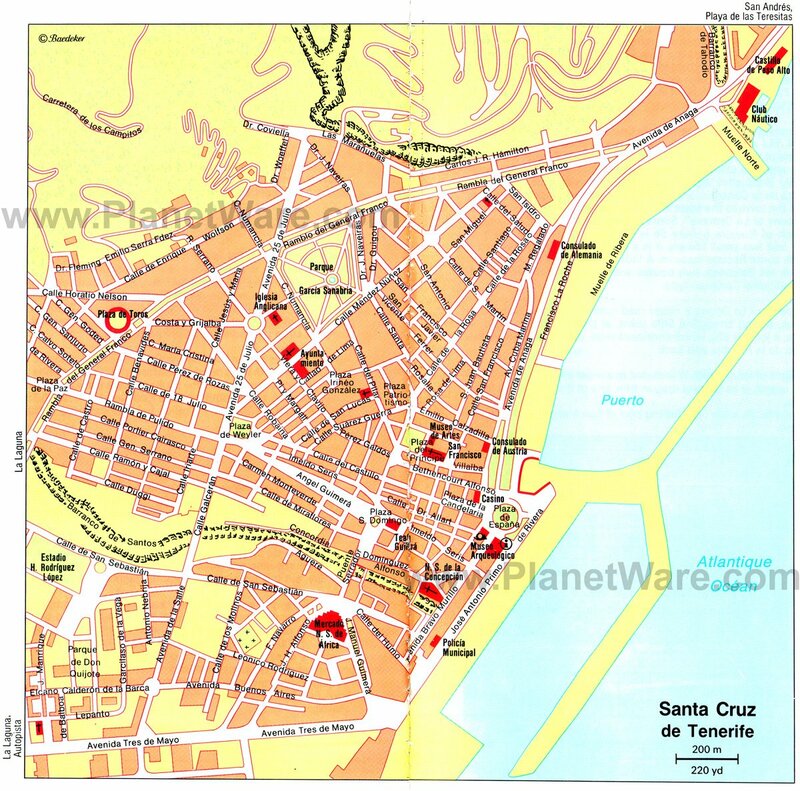 Santa Cruz de Tenerife is the busy main port with ultramodern bank buildings and plenty of traffic. The pleasant town center is the Plaza de Espana. In its center stands an unusual tower in the form of a four-sided cross. Activities in town may include visits to several museums and strolling through the shady Municipal Park, where you can admire a unique assortment of tropical flora. Plenty of sidewalk cafes await your patronage. Santa Cruz de Tenerife Hop-On Hop-Off Tour. Hop on and hop off as many times as you like at the 12 conveniently located stops around the city. Also cabbies offer tours around the island, be sure to negotiate clearly beforehand i.e. is the price per party or per person. Mount Teide (Tenerife's and Spain's highest point), Las Canadas National Park (famed for its spectacular volcanic rock formations. From the parking lot tourists are brought to the volcano by a cable lift which ends at 3550m. An organized excursion is your best bet here, due to the distance. La Laguna is a city in Tenerife. It is the oldest city on the island and former capital and recently designated a world heritage site. There is now a tram running from downtown Santa Cruz next to the Plaza de Espana direct to La Laguna (Line #1). The closest stop to the old town is the terminus of the route (La Trinidad). It is little over an euro one way and takes about 40 minutes. Tenerife has a more or less tax-free status: many electronics and perfume stores around. Tobacco pruducts are really at a discount here and are often much cheaper than the cruise line offerings. Many shops observe siesta time between 1:00 p.m. and 4:00 p.m. In the center of Santa Cruz main stores remain open throughout. For upscale shopping head for El Corte Ingles, an upscale and large department store with a shopping center attached. A 15 minute walk from port or 4 Euro taxi ride away. Free Wifi is offered at many sidewalk cafe's. Mcdonalds at the main square is favorite by the cruise crews.